Audrey Elisabet: A trip to the park. We took a trip to the park yesterday. I know it is sad but we have only once taken Ylfa to the park before and she was extremely tired and grumpy so it was not very enjoyable. But yesterday she had just taken her nap so she was not sleepy at all. There is a really nice park on 25th avenue between Lake and California and it's only fifteen minute walk from us. She was so happy! 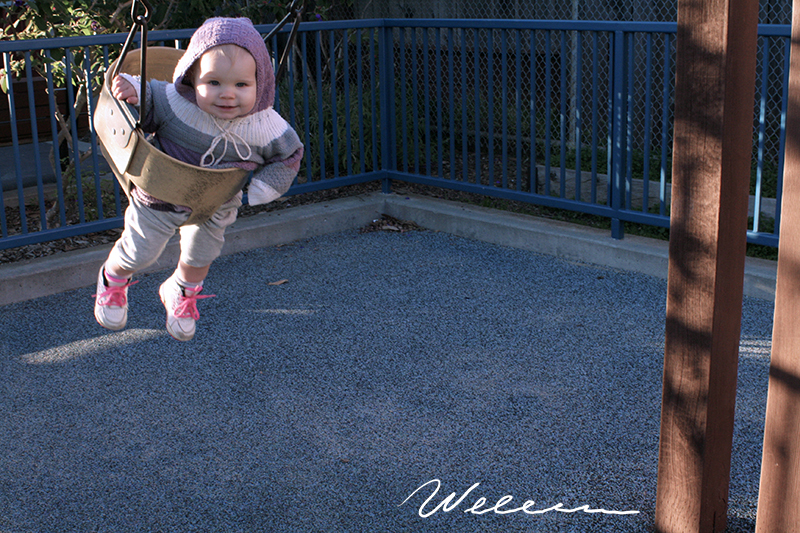 She got to try the end of the slide and a little rocking sheep but the swing was a favorite. It was such a fun thing to do with her, I loved seeing how much she enjoyed flying through the air! A trip to the park will likely become more of a regular thing now, and especially when she becomes a little bit older. I also think it's good for her to be around other children. She has not been around any children since we left Iceland in September. I really want to take her to a class the Waldorf school in San Francisco has for children and their parents. It would be good for both of us to get out there a little bit more and meet people.